VEGAPULS 64 is the first radar level sensor on the market for liquids that measures at a frequency of 80 GHz. This feature enables considerably better focusing of the radar beam. With this new instrument, measuring is much easier and more reliable, even under difficult conditions, such as tanks fitted with heating coils, baffles or agitators. Before VEGAPULS 64 was launched, a radar sensor with a transmission frequency of 26GHz and an 80 mm diameter antenna had a beam angle of approximately 10°. With the same size of antenna, VEGAPULS 64 has a beam angle of only 3°. This allows the sensor to be used even in vessels with internal installations or a heavy build-up on its walls, as VEGAPULS 64’ focused microwave beam simply avoids these obstacles. The larger the dynamic range of a radar sensor, the higher the measurement certainty and the wider the range of applications that the sensor can be used for. Until recently, there was no radar sensor for liquid applications on the market with the dynamic range of VEGAPULS 64. This means that media with very poor reflective properties, ie a low dielectric constant, can now be measured with more certainty than with the previous radar sensors. Even foam, turbulent product surfaces, condensation or build up on the antenna are no problem – VEGAPULS 64 measures more reliably due to its greater measurement certainty. It has an accuracy of ±2 mm, even with a measuring range of 30m. VEGAPULS 64 radar level sensor is not only suitable for wide usage in the chemical industry, but also in the pharmaceutical and food industries, because of its hygienic materials and design. The relevant approvals for this sector, such as 3-A, FDA and EHEDG, are available. 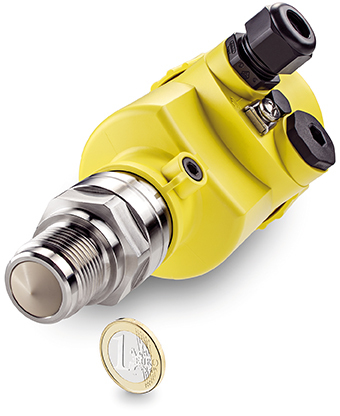 Thanks to its small antenna – the diameter of the smallest version is no larger than a 1 euro coin – it results in very compact process fittings, which means the sensor offers an interesting alternative for confined spaces in small vessels.